We are running the game through a chain of servers and remote software to create a glti.chy soup for viewers playing at Tactical Glitches. Your involvement will help make that soup even glti.chier – how will the players evolve their Tactics to cope with your onslaught? 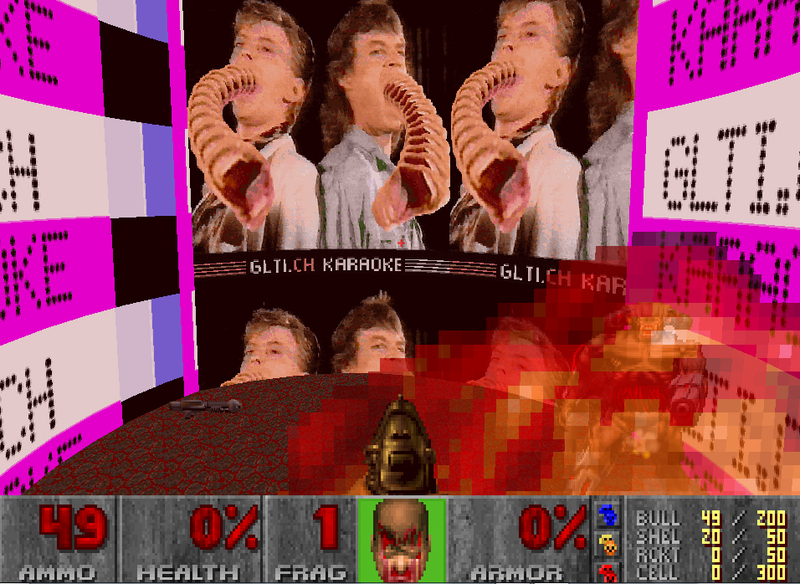 Download the PC or MAC version of Zandronum (a freeware program for playing Doom). Install Zandronum on your system (make a note of exactly where it installs on your computer e.g. C:\Program Files\Zandronum). Download our GLTICH WAN PARTY MAP pack. Copy/move/save the map into the Zandronum directory (e.g. C:\Program Files\Zandronum). You will also need to have the Doom2.wad, or Freedoom equivalent. Unzip this into the same directory at Zandronum. Now, if you open up the Zandronum directory you will see another directory called ‘Doom Seeker’. Go into there and load the Doom Seeker application. First up, it is worth checking your settings are correct. Go into the ‘options’ menu then click ‘configure’. Go to ‘Engines’, make sure the ‘executable’ points to Zandronum (e.g. C:\Program Files\Zandronum\zandronum.exe). Go to the ‘File Paths’ setting. Make sure your Zandronum directory is listed here (e.g. C:\Program Files\Zandronum) – add it if it isn’t. Save and go back to the main Doom Seeker screen. You will now see a long list of servers. Our server is called TACTICALGLITCH, it has a British flag. Scroll down until you find it, or alternatively click the ‘Servers’ column header to arrange the list anti-alphabetically. It should be near the top. Double click the server to join! Press SPACEBAR to jump into action! Troubleshooting: If you have any problems setting up or connecting let us know in the comments section below. T = Type a message and press ENTER to broadcast it! BONUS: Press the ¬ key on your keyboard (usually under the escape key) and type “name CHOOSEAFUNNAME” to change your player name! As well as killing innocent players in SUDLAB Gallery, Naples, there are lots of secrets to discover on the map. The monsters WILL KEEP ON COMING! The body count WILL KEEP ON RISING! Have fun! Invite your friends, and get Tactical. Massive thanks to curators and collaborators Nick Briz and Rosa Menkman, as well as SUDLAB Gallery, Naples, and Domenico Dom Barra!